Dr. Jonathan graduated from St. Johns High School in 2003. He received a Bachelor of Science in Human Biology from Michigan State University in 2007 and went on to attend the University of Michigan School of Dentistry. 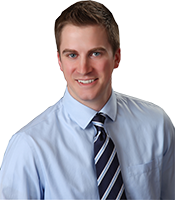 Shortly after graduating from Dental School in the Spring of 2011, Dr. Jonathan began working alongside his father and brother at Koenigsknecht Dentistry. He lives in St. Johns with his wife, Jessica and three children, Maggie, Lincoln and Bowen. Dr. Jonathan received extensive training in aesthetic dentistry, root canals, extractions, crowns, bridges, pediatric dentistry, treatment of temporomandibular joint disorders, and migraines while at the University of Michigan. Dr. Jonathan sees patients Monday-Friday.